Affordable, remanufactured products that are as good as new. Did you know that HP hardware is available to us as remanufactured product? We purchase this equipment from HP and pass the benefits onto you. Products include servers, laptops, monitors, printers & networking. All equipment is provided with a refreshed warranty that is the same as a new product. Contact us for current HP Renew product availability. 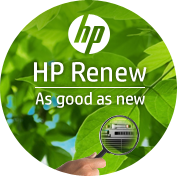 For more information about remanufactured HP products, visit the HP Renew website. If you are looking at another manufacturer as well as HP we can get you an additional competitive discount from HP. We can also get you lower pricing if you purchase a reasonable quantity in one order or even over a period. There are many new HP products we can supply on sale or return basis. Alternatively we have access to equipment for your exclusive testing. If there is a product you wish to evaluate just call. New hardware reduced due to cardboard packaging damage. It includes the full manufacturer's warranty. The hardware has been tested. From HP's own demonstration pool this equipment has minimal or no use, full Hp warranty, original packaging and all accessories. If you have legacy equipment which requires duplication for imaging purposes, or, if you need spare parts, then Shape Systems Ltd is the place to start. We hold maintenance stocks of spares and obsolete products. We have invested in a world wide dealer network which allows dealers all over the world to upload their stock onto a central database as a result. If the product is not in stock we'll be able to find it. You can trade in your old hardware against new hardware. Reduces your cost, and, enables you to meet new government recycling guidelines at no cost. ANY product, ANY badge, ANY age! Maintenance contracts tailored to support all requirements. Additional services include virtualisation, exchange products, imaging, on site installation and pre configuration. Whether it is gigabytes or terabytes, NAS or SAN, disk or tape, speak to us. Solutions to suit all budgets are available by various manufacturers. All kinds of electrical work plus cabling are carried out by our on site engineers. They also have the added advantage of our IT support.